AVS Steps specialises in electric and manual foot operated vehicle steps for taxis, minibuses, ambulances. 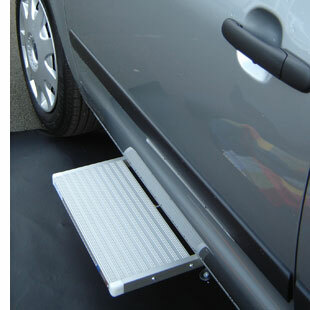 They also supply steps for other special vehicles such as motor caravans and mobility vehicles. AVS Steps offer have a number of specialist passenger steps ideal both recovery and goods vehicles. Their step catalogue offers the widest range of vehicle steps that will improve access into thousands of vehicles. Their fitting kits and wiring harnesses ensure an efficient fit to dozens of vehicle types. Their fast and friendly advice and next day delivery means that their vehicle steps are bound to be the ideal solution for you. Special options include touch sensitive edge, extra deep tread, illuminated edge and highlighted or reflective edges. AVS products are designed and manufactured in the UK. AVS steps have distributors and service agents worldwide and is always looking for more high quality distributors in more countries. For more information about AVS Steps and the vehicle steps they offer, or to view their step catalogue, check out their website.